The full moon of January 11, 2017 rises over Glastonbury Tor in Somerset, England during a so-called Wolf Moon. At 2:08 a.m. EDT on April 11, the Full Pink Moon will light up the night sky. The first full moon of spring for observers in the Northern Hemisphere will peak early Tuesday (or late tonight), depending on your time zone. 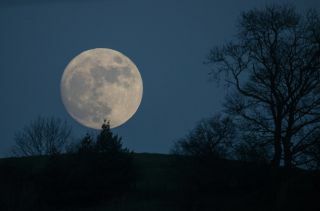 The April full moon, known as a "Pink Moon," will shine overnight tonight (April 10 to 11), and skywatchers will be able to see the bright, beautiful moon all night long. For those who want to catch the moon at its fullest and most illuminated — when it is exactly opposite the Earth from the sun — the time to look is 2:08 a.m. EDT (0608 GMT) the morning of April 11 — or 11:08 p.m. PDT tonight (April 10) for those on the West Coast. The moon will first rise at 8:02 p.m. EDT (1202 GMT, April 11) on the East Coast, and will rise at 7:04 p.m. PDT on the West Coast. The Pink Moon is also called the Sprouting Grass Moon, the Egg Moon and the Fish Moon. The "pink" part of its title, used by Native Americans and early colonial Americans, refers to a spring flower called moss pink, or wild ground phlox, that appears around the same time as the moon, according to the Old Farmer's Almanac. Skywatchers will also be able to spot Jupiter near the moon tonight — viewers in Europe and farther east will be able to see them reach within two degrees of each other in the sky. (An outstretched fist in the sky covers about 10 degrees.) At points farther west, like the United States, observers will still be able to see the moon, Jupiter and the Spica star system form a tight triangle in the sky. Jupiter was recently in the same position as the moon now is — on the opposite side of Earth from the sun, called opposition — which marked the closest it will come to Earth in 2017.